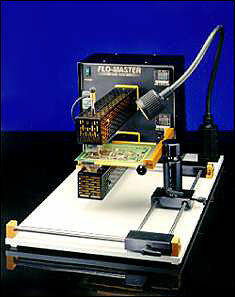 Flo-Master-Z SMD 5000 | Welcome to A.P.E. The Flo-Master BGA/SMT rework and repair engine is a fully integrated dual, top and bottom heat system designed to handle BGA’s, military-type boards, and commercial applications requiring an efficient level of power vs. temperature. The Flo-Master-Z BGA/SMT rework and repair engine is a fully integrated dual, top and bottom heat system designed to handle BGA’s, military-type boards, and commercial applications requiring an efficient level of power vs. temperature. 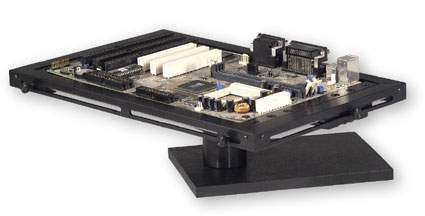 Increased Power availability reduces the necessary air temperature needed to Reflow. A reduction in Reflow Temperature results in higher solder viscosity, producing improved alignment characteristics for BGA and SMT components. The Heat Acceleration Chamber and delivery Nozzle Block are designed to provide maximum air spin of the air flow to the nozzle, ensuring minimal temperature differences across wide area packages, important for linear reflow of CCBGA and larger devices. 5000-2000-Z Flo-Master 110v Z-Axis Unit Includes: Power Supply 110v, Reflow Head with 2.500″ of Z-Axis travel (1200watts), Integrated Localized Pre-Heat System (600watts), Digital Controller with all 4 modes of operation, 8″ x 12″ Frame Holder on linear rails, Self-Contained Vacuum IC removal device, SMD Tool Kit, Halogen Light w/ mounting bracket, Chipmaster T and Sniper Demonstration video, Foot Pedal, Power Cord, three user-selected Reflow nozzles, and two user selected pre-heat nozzles. 5000-2002-Z Flo-Master 220v Z-Axis Unit Includes: Power Supply 220v, Reflow Head with 2.500″ of Z-Axis travel (1200watts), Integrated Localized Pre-Heat System (1200watts), Digital Controller with all 4 modes of operation, 8″ x 12″ Frame Holder on linear rails, Self-Contained Vacuum IC removal device, SMD Tool Kit, Halogen Light w/ mounting bracket, Chipmaster T and Sniper Demonstration video, Foot Pedal, Power Cord, three user-selected Reflow nozzles, and two user selected pre-heat nozzles. 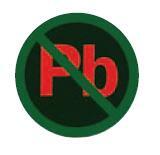 Rework soft plastics and sensitive components requiring short heat cycles. APE also offers video narrated trials to help in the evaluation process, our lab technicians will perform your job and return the completed work with the video. A bottom preheat and in-process heat source, ensures stability of board temperature, reducing the necessary top reflow temperature, thereby following a more precise profile structure for the component undergoing rework. A range of temperature profiles are installed for bottom and top controllers and each thermal profile may be custom programmed, enabling different combinations of preheat and removal temperatures to be selected. 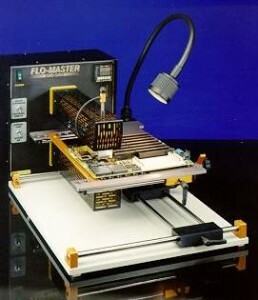 The Flo-Master has been engineered to operate on a standard workbench and includes a built-in X-Y Table for precise alignment. Each of the axis can be locked for optimum control.